Atrial arrhythmias: this includes atrial fibrillation, atrial flutter, and atrial tachycardia. SVTs, in particular AF, have a significant impact on mortality and morbidity, by increasing stroke and thromboembolic risk, increasing progression to ventricular arrhythmias, precipitating hemodynamic instability, as well as increasing hospital stay and increasing risks from iatrogenic interventions (anticoagulation, pacemakers, arrhythmic drugs). AF is the most common SVT occurring in the perioperative period for cardiac surgery, and it occurs in an estimated 30% of patients undergoing coronary artery bypass grafting (CABG), 40% of those undergoing valvular surgery, and 50-55% of patients having combined procedures. Furthermore, the mechanisms of onset of SVT, as well as the type of cardiac surgery, also require individual consideration, as patients with congenital heart disease undergoing Senning or Mustard repairs will have different comorbidities than patients with degenerative valvular disease, those with ischemic heart disease, or those requiring orthotopic cardiac transplantation. Patients with surgically repaired congenital heart disease may experience tachyarrhythmias/SVTs as a result of hemodynamic disturbances, and thus an extensive evaluation of residual shunts/intracardiac pressures is often warranted sooner than for those with SVTs and acquired heart disease. Atrial tachycardias are common after mitral valve surgery, occurring in the early postoperative period (due to transient ischemia, pericarditis, type of surgical approach) as well as in the late postoperative period (multifactorial – aging, myocardial remodeling). 1. Management depends on hemodynamic stability. 3. Rate control. 50-60% will spontaneously revert to sinus rhythm within 24 hours. 5. Assess need for long-term therapy. Emergency management is according to Advanced Cardiac Life Support (ACLS) protocol (see Figure 1). 1. Patients with evidence of hemodynamic compromise require immediate synchronous direct current (DC) cardioversion. This can be achieved externally or internally in the case of thoracotomy procedures. Restoration of sinus rhythm may only be temporary but may provide time to consider potentially reversible causes of SVT. Potential side effects of DC cardioversion are stroke, ventricular fibrillation, bradycardias and asystole. 2. Adenosine can be used as an alternative when hemodynamic stability is present. For patients with WPW and AF, all AV nodal blocking agents should be avoided (beta-blockers, calcium channel blockers, digoxin, adenosine) due to the risk of unopposed conduction down the accessory pathway. DC cardioversion should be used for unstable patients, with IV procainamide the drug of choice for slowing conduction down the accessory pathway. Esmolol has ultra-rapid elimination and can be titrated from minute to minute. Limited by potentially negative inotropic effects. Avoid in left ventricular dysfunction. B1-receptor selective, so can be used in patients with chronic lung disease. Verapamil and diltiazem. Both are effective at controlling ventricular rates via AV nodal blockade within minutes, but also have negative inotropic properties, with diltiazem less so. Lacks vagotonic effects, and takes approximately 6 hours for full onset of action, so requires a supplemental agent in the short term. 4. Chemical cardioversion in patients not tolerating rate control, or not responding to DC cardioversion. Consider risks/benefits of need for cardioversion. Up to 50-60% will spontaneously revert to sinus rhythm. Drugs to consider for chemical cardioversion are IV procainamide, amiodarone, ibutilide, and sotalol. Increased electrolyte imbalance predisposes to drug-induced proarrhythmias. Do I need to treat? (ii) Evidence of myocardial ischemia? (iii) Evidence of heart failure as a result of the arrhythmia? AF often occurs between 2 and 4 days post-op, with a peak incidence at day 2. AF and AFlutter are associated with acute graft rejection and transplant vasculopathy, but can also occur in the early (1-6 days) postoperative period. The occurrence of persistent or paroxysmal SVT in patients with cardiac transplants should warrant urgent transplant specialist assessment, specifically evaluating the patient for evidence of acute graft rejection or transplant vasculopathy (echocardiogram, right ventricular endomyocardial biopsy, coronary angiogram). SVT s in this situation are often due to, or associated with, hemodynamic deterioration (shunts, right ventricular dysfunction, valvular dysfunction) and require urgent specialist assessment. The use of antiarrhythmics with less hypotensive side effect profiles is recommended (ie, avoid IV beta-blockers, calcium channel blockers, where possible). 3. Laboratory parameters: Full blood count to assess hemoglobin, leukocyte count, as well as electrolyte assessment: urea, serum creatinine, magnesium, potassium, calcium. Serum potassium should be >4.5 mmol/l. 5. Assess fluid balance and hemodynamic status, and correct hypovolemia where possible. At the bedside, the 12-lead ECG is the basis of SVT diagnosis, in context with continuous monitoring (which may be sufficient for diagnosis alone). Multiple 12-lead ECGs may be required where paroxysmal SVT is occurring. If the 12-lead ECG is not diagnostic, invasive electrophysiologic studies with programmed electrical stimulation may be required to uncover accessory pathways or other SVTs, particularly where risk of progression to ventricular arrhythmia or sudden death may be suspected. Current ESC and EACTS guidelines recommend the use of an oral beta-blocker (metoprolol, carvedilol) as first-line therapy, in the absence of contraindications, to prevent postoperative AF. Sotalol may also be used for the prevention of AF without causing an excess of side effects. Amiodarone may also be used for prophylaxis of AF in cardiac surgery patients, where use of a beta-blocker is not possible or where patients are at high risk and require additional prophylaxis. If dual therapy is used, temporary pacing wires should be inserted intraoperatively to prevent complications from bradycardias. Biatrial pacing is recommended over right atrial pacing, where pacing rates of 80-90 bpm should be employed for 3-5 days. For refractory cases, prophylaxis with magnesium has also shown to be effective (this is in contrast to patients with AFlutter, where magnesium therapy has no role for rate control or cardioversion). For patients with chronic AF, rate control is recommended using AV nodal blockers (beta-blocker, calcium channel blocker). The use of digoxin in the perioperative period, as a de novo treatment, has limited effect due to its minimal effect on vagal tone. In patients with pulmonary disease, once hypoxemia and acidosis have been corrected, diltiazem or verapamil may be considered for controlling ventricular rates, unless there is evidence of ventricular dysfunction. In that case, amiodarone may be considered. Where hemodynamic instability is present, DC cardioversion should be attempted. Pharmacological or DC cardioversion is recommended in patients with new-onset postoperative AF. Stroke risk is doubled with postoperative AF lasting >48 hours. It is recommended that full anticoagulation should be commenced within 48 hours of AF initiation, which is often at days 2-6 post surgery. There is an increased risk of cardiac tamponade for patients fully anticoagulated within 48 hours of surgery, so this should be avoided where possible. Anticoagulation should be done using therapeutic low-molecular-weight heparin or unfractionated heparin, while initiating warfarin therapy to a target INR of 2.0-3.0. It is also recommended that therapeutic-dose heparin be stopped 48 hours after target INR is achieved, due to residual vitamin K analogues still present in the circulation. For patients with repaired or unrepaired congenital heart disease, the occurrence of SVTs should warrant referral to a specialist center, as well as a search for any potential hemodynamic cause for the arrhythmia. Given the complex nature of many of the congenital cardiac defects (shunts, single ventricle physiology, pulmonary hypertension), SVTs may occur due to multiple atrial circuits, rather than a single aberrant pathway. Sinus nodal disease also occurs, and may thus lead to concurrent bradyarrhythmias, often requiring pacemaker insertion. (i) For failed antiarrhythmic drug therapy with symptoms, in the case of repaired atrial septal defect (ASD) or previous surgical repair for transposition of the great vessels (Mustard or Senning repair), recommended treatment is catheter ablation in an experienced center (Level 1C). (ii) For hemodynamically significant unrepaired ASD and AFlutter, closure of the ASD is recommended with catheter ablation of the isthmus. (iii) For paroxysmal SVT and Ebstein’s anomaly, with hemodynamic indications for surgical repair, catheter or surgical ablation either at the time or before operative repair (multiple accessory pathways may be present) is recommended. Recommended regimen is 6 mg (or 3 mg for special-precaution patients as above), followed by 12 mg if termination does not occur, and a further 12 mg. There is no evidence that any further doses are effective. 500 micrograms/kg over 1 minute, then 0.005-0.2 mg/kg/min. Benefits from short duration of action, but may worsen congestive heart failure and cause bronchospasm and hypotension. IV: Initial dose 0.25 mg/kg over 2 min, with BP and ECG monitoring. Further doses of 0.35 mg/kg after 15 mins if required. IV: 150 mg over 10 min bolus, then maintenance 360 mg over 6 hours, 540 mg over remaining 24 hrs. 0.5 mg/min thereafter or switch to oral. IV: 0.25 mg every 2 hours, to a maximum of 1.5 g (loading). Maintenance dose 0.125 mg daily or switch to oral. The expected response to treatment is restoration of sinus rhythm, or adequate ventricular rate control. 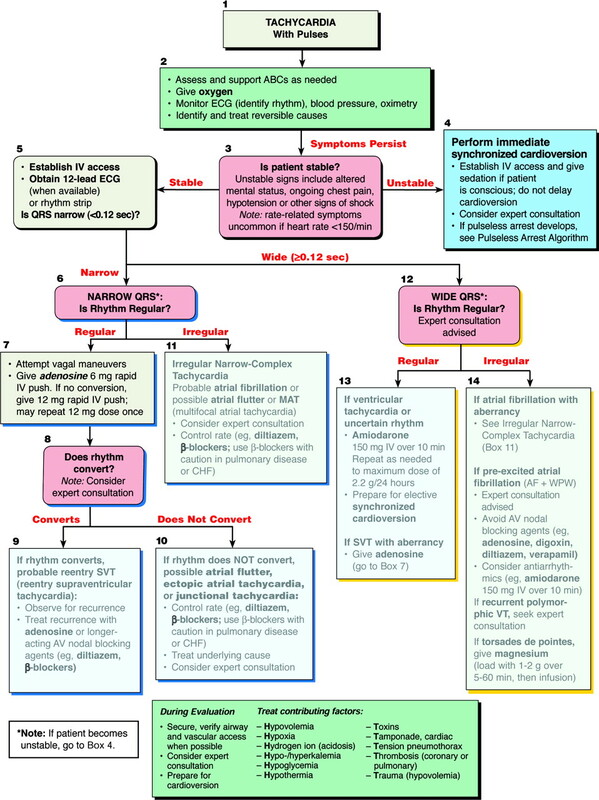 In the case of chemical cardioversion or maintenance of sinus rhythm, the potential side effects of any class of antiarrhythmic drugs should also be considered. In particular, proarrhythmic properties, the occurrence of torsades de pointes, ventricular tachyarrhythmias, and prolongation of the QT interval, may occur. The prognosis for patients with AF relates to the association of increased risk of stroke (up to 3 times higher), as well as increased 6-month hospital mortality. The average estimated increase in hospital stay is 3-5 days. There are no specific guidelines available for who and who may not require follow-up. For any patient with evidence of a newly diagnosed accessory pathway, then follow-up with a specialist is recommended. For patients with SVT and congenital heart disease, close follow-up in a specialist center is recommended. For patients who have recurrent SVTs during surgery, or in particular in the days after surgery, then specialist follow-up is reasonable. Preoperative AF and advanced age are the most important risk factors for the development of intraoperative SVTs. Hypertension and diastolic heart disease, diabetes, genetic predisposition, metabolic syndrome, and left atrial enlargement have all been associated with an increased incidence of perioperative AF. The type of procedure also plays some role, with higher incidences of SVT occurring in patients undergoing CABG and valvular repairs/replacement, as well as those requiring bicaval venous cannulation or manipulations of the pulmonary vein. Volume changes and atrial ischemia also play a role in intraoperative AF occurring. Atrial tachycardias after mitral valve surgery are common and relate to focal re-entrant circuits, as well as increased triggered activity. To access the mitral valve surgically, left atrial incisions may be achieved via the interatrial groove, transeptally, or via a right lateral approach. These, in turn, relate to the types of AFlutter often seen with electrophysiologic mapping studies, which have been described as ‘surgery-specific’ intra-atrial re-entrant tachycardias (IART). These include right atrial IART, left atrial IART, and isthmus-dependent IART. The type of SVT also depends on the particular lesional anatomy, but many features remain common: the development of pulmonary hypertension and right ventricular dysfunction, biatrial enlargement and volume overload, as well as the occurrence of atrial flutter, which may be isthmus or non-isthmus (‘scar’ or ‘incisional’) dependent. The loss of atrial activity with SVT may cause severe ventricular dysfunction and has been associated with an increased risk of mortality in some studies. Where atrial incisions occur, such as for tetralogy of Fallot repairs, 10-30% of patients during long-term follow-up experience atrial arrhythmias. SVTs (AF, AFlutter, AVNRT, AVRT – for a description of SVT subtypes see the chapter “SVT (non-cardiac surgery)”) occur in transplanted hearts due to several factors: perioperative hemodynamic or neurohormonal factors, underlying accessory pathways in the donor heart, surgical scars with proarrhythmic properties at anastomotic sites (AFlutter, AT), as well as occurring in patients with active graft rejection or transplant vasculopathy/acquired ischemia (AF). In the case of graft rejection, there is evidence of myocardial edema and fibrosis occurring, which may then lead to heterogeneous circuits of conduction or repolarization in the atria, thus leading to AF or AFlutter. The incidence of AF and AFlutter has been reduced with newer surgical techniques, such as the use of bicaval right atrial anastomoses and pulmonary veins with single atrial cuffs. Interestingly, AF rates are significantly lower than those reported for other types of thoracic surgery (valvular, congenital, CABG, double lung transplant), suggesting that the inherent autonomic denervation and pulmonary vein isolation due to suture lines that occurs with cardiac transplantation may play a protective role. AF in the perioperative cardiac surgery period is associated with an increased risk of stroke (5.2% vs 1.7% with no AF), as well as increased morbidity and mortality. SVT during surgery is also associated with increased hospital stays, ventricular fibrillation, and requirement for pacemakers. For repaired congenital defects, the incidences vary between subgroups. In the setting of repaired ASDs, approximately 14% of patients continue to have atrial arrhythmias during long-term follow-up. This risk is significantly increased with age >40 years. In one series, 2.1% of patients during follow-up after ASD repair had cerebral embolic events. In a large retrospective series of 729 patients with cardiac transplants, 7.1% had SVTs, with 3.7% requiring electrophysiologic study and radiofrequency catheter ablation (ie, drug resistant) of their SVT. Catheter ablation was successful in all cases. Isthmus-dependent AFlutter was the most common SVT (58%), with scar-related AT also common (29%). The low rate of AF (4%) occurred in patients with evidence of sepsis, graft vasculopathy or acute rejection, thus highlighting the need for an immediate evaluation under these circumstances. Dunning, J, Treasure, T, Versteegh, M. “Guidelines on the prevention and management of de novo atrial fibrillation after cardiac and thoracic surgery”. Eur J Cardio-thoracic Surgery. vol. 30. 2006. pp. 852-72. Vaseghi, M, Boyle, N, Kedia, R. “Supraventricular tachycardia after orthoptic cardiac transplantation”. J Am Coll Cardiol. vol. 51. 2008. pp. 2241-9. Echahidi, N, Pibarot, P, O’Hara, G. “Mechanisms, prevention, and treatment of atrial fibrillation after cardiac surgery”. J Am Coll Cardiol. vol. 51. 2008. pp. 793-801. Warnes, C. “The adult with congenital heart disease”. J Am Coll Cardiol. vol. 46. 2005. pp. 1-8.